At this location in January of 1854, the Great Pathfinder of the American West, John C. Fremont, and 21 other men found themselves in the middle of winter. 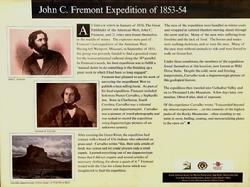 The explorers were part of Fremont's last expedition of the American west. Having left Westport, Missouri, in September of 1853, the group was privately funded to find a practical route for the transcontinental railroad along the 38th parallel. 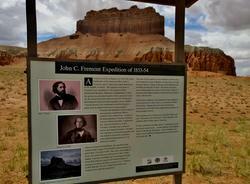 In Fremont's words, his final expedition was to fulfill a "natural desire to do something in the finishing up a great work in which I had been so long engaged". Fremont had planned to use his work of surveying the magnificent West to publish a best-selling book. 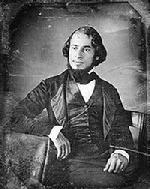 As part of his final expedition, Fremont included Solomon Nunes Carvalho, a Sephardic Jew. Born in Charleston, South Carolina, Carvalho was a talented painter and daguerreotypist. Carvalho was a pioneer of travel photography and was tasked to record the expedition using daguerreotype pictures of an unknown country. After crossing the Green river, the expedition had contact with a band of Ute Indians who subsisted on grass seed. Carvalho writes "this, their only article of food, was scarce and we could procure only a small supply. I parted everything out of my daguerreotype boxes that I did not require and several articles of necessary clothing, for about a quart of it." Fremont traded with the Utes for a lame horse which was slaughtered to feed the expedition. The men of the expedition were bundled in winter coats and wrapped in tattered blankets moving ahead through the snow and ice. Many of the men were suffering from frostbite and the lack of food. The horses and mules were walking skeletons, and so were the men. Many of the men were without animals to ride and were forced to walk on frozen feet. 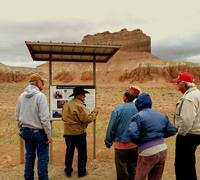 Under these conditions, the men of the expedition found themselves at this location, now known as Wild Horse Butte. Despite the cold, snow and freezing temperatures, Carvalho took a daguerreotype picture of this geological feature. The expedition then traveled into Cathedral Valley and on to Thousand Lake Mountain. A few days later, one member, Oliver Fuller, died of exposure. Of this experience Carvalho wrote, "I succeeded beyond my utmost expectations...on the summits of the highest peaks of the Rocky Mountains...often standing to my waist in snow, buffing, coating, and mercurializing plates in the open air". 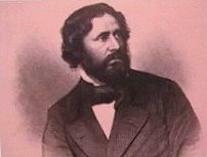 Carvalho published a famous journal of the expedition when he returned to New York. Fremont had planned to write his own but never did. and a perilous trip across the Great American Desert to the Pacific.